The beauty of the Orthodox church and the reverence of the Divine Liturgy really touched my soul. I decided that although we would raise our daughter as a Roman Catholic, I would try to expose her to the Orthodox faith occasionally. It only seems right, since she spent her toddler years in a children's home sponsored by the Russian Orthodox church, and she was baptized in the Russian Orthodox faith. Several months ago I discovered The Crafty Contemplative blog. Written by an Orthodox woman named Amy, the blog gives a wonderful insight into some of the feasts and traditions of the Orthodox faith. It's interesting to compare the similarities and differences between our two faiths. I purchased three of her "learning boxes" for these feast days: Ascension, Pentecost and the Feast of Saints Peter and Paul. Thought I'd share a bit about the Saints. Peter and Paul box since their feast day is celebrated tomorrow (Wednesday, June 29). Can you believe this kit only cost $8? It would cost me alot more if I had to run around town to find all the components myself. Project 1: Saints Peter and Paul -- read passages in Luke about Peter, then create little figures of the saints with the included wooden pegs. All of the completed items can be stored in the box, which can be used at home (perhaps on a home altar or in a prayer corner?). Alternatively, the box is easy to transport to church, to keep little ones occupied in an appropriate way during Mass. Isn't it an amazing little learning box? I can't wait to finish ours and will post photos when we are done! wow, how wonderful! those crafts look great. 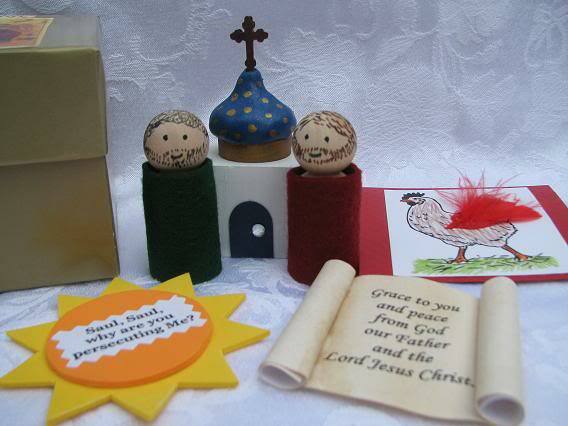 how wonderful to find a site that teaches the faith through crafts. I'll definitely be checking it out. thanks for the tip, Cheryl. What a great way to learn about feast days for children. Especially for children who are visual and like to make crafts. Hi Cheryl, Thanks so much for sharing your work and the tip about the Orthodox Christian Craft Company! My family is planning a trip to Russia in October and I might just have to order a kit like this for my kids beforehand. Thanks for dropping by my blog as well, and please tell your daughter "Privyet" from me! I hope she will always treasure her Russian heritage. Kudos to you for exposing her to the beauty of the Orthodox church!